and lower latency in wireless networks. It has culminated in the development of the fifth generation (5G) wireless communication systems, expected to be deployed by the year 2020, with key goals of data rates in the range of Gbps, billions of connected devices, lower latency, improved coverage and reliability, and low-cost, energy efficient and environment friendly operation. Currently, the deployment of Long Term Evolution (LTE) systems has provided a timely capacity boost to cellular networks. However, to meet the ever-increasing demands in wireless traffic which is projected to increase by about 1000 fold by the year 2020, and keeping in mind that the current wireless spectrum is almost saturated, it is imperative to shift the paradigm of cellular spectrum to a new range of frequencies. In this regard, Millimeter wave (mmWave) bands with significant amounts of unused or lightly used bandwidths appear to be a viable way to move forward. With bands of 20-100 GHz available for communication, mmWave can be the cornerstone in the design of 5G networks. 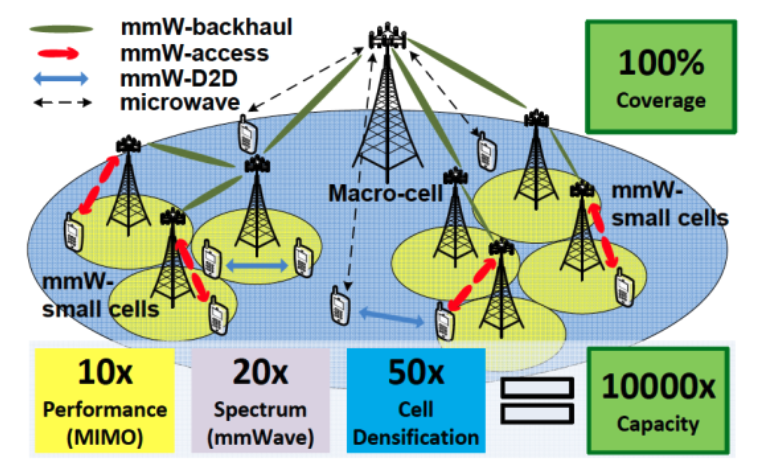 Mmwave spectrum will function differently from the microwave spectrum (< 6GHz), and as such, communication in mmwave network is hindered by factors that have little or no consequence at lower frequencies. We investigate the potential benefits of deploying relays in outdoor millimeter-wave (mmWave) networks. We present a relay modeling technique for mmWave networks considering blockages and compute the density of active relays that aid the transmission. Two relay selection techniques are discussed, namely best path selection and best relay selection. We analyze the end-to-end signal to noise ratio (SNR) and compute the best random relay path in a mmWave network using order statistics. Moreover, the maximum end-to-end SNR of random relay paths is investigated asymptotically by using extreme value theory. Furthermore, we also analysis of secure communication in millimetre wave networks. We explore on the possibilities of a secure network aided by blockages and accordingly design certain security regions, in which secure transmission can be guaranteed. S Vuppala, S Biswas, T Ratnarajah, “On the Security Region of Best Source Indices in Random Wireless Networks,” In Proc IEEE International Conference on Communications, Kuala Lumpur, Malaysia, May 23-27, 2016. S. Vuppala, S. Biswas, T. Ratnarajah, M. Sellathurai, "Analysis of secure communication in millimetre wave networks: are blockages beneficial?," In Proc IEEE 41th International Conference on Acoustics, Speech and Signal Processing, Shanghai, China, March 20-25, 2016.